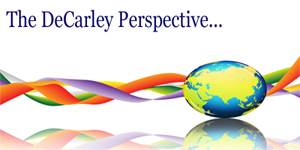 This futures market analysis was emailed to DeCarley Trading brokerage clients on October 11, 2009. With earnings season upon us once again, investors will be given some insight into the recovery and the role the consumers are playing in it...if any. However, it is important to note that although most firms were able to beat the street's expectations in the second quarter, earnings were padded by dramatic cuts in expenses rather than increased revenues. Additionally, a large part of the cuts were made in labor which had a negative impact on the consumer...and in turn potential revenue for all firms. It seems a bit naive to believe that the vicious circle is complete; as a matter of fact we have likely not seen the full impact of first and second quarter lay-offs. The last time around, the earnings bar was set incredibly low, and this time around expectations are only moderately higher. It seems as though investors have been conditioned to accept mediocrity and have bid stock prices up accordingly. The PE ratio for the S&P is incredibly high; in fact it is currently at an all-time high that is completely off the charts relative to any previous readings. Of course, the market expects that corporations will grow into their PE ratios but this appears to be a tall order in the near-term. Historically, the PE ratio of the S&P tended to peak in the low 20's but in the dot com explosion fluctuated between 20 and 40. As a result of dismal, yet better than expected, second quarter earnings and the relentless rally in equities the PE ratio has spiked to the low 120's. The bottom line is that revenue and growth will have to catch up with the market or the market will have to adjust to more realistic multiples. Fundamentally, stocks should be ready for a breather but reality suggests otherwise. 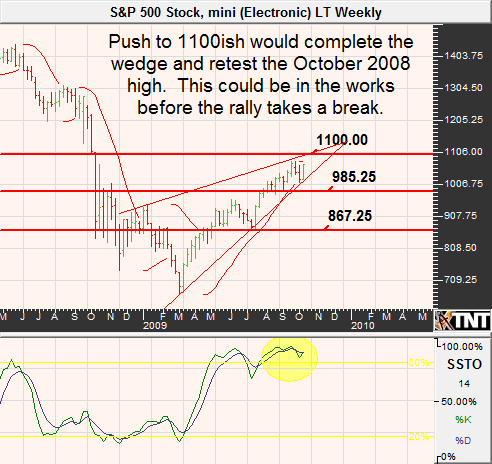 The trend is higher and momentum looks as though it could bring the S&P moderately higher before a reversal can occur. In the last newsletter, we mentioned resistance at 1072 and our bearish intentions from such levels and this turned out to be accurate. Our same models are showing that the S&P could see 1095 to 1100 before backing off and we will be looking for bearish opportunities from there. 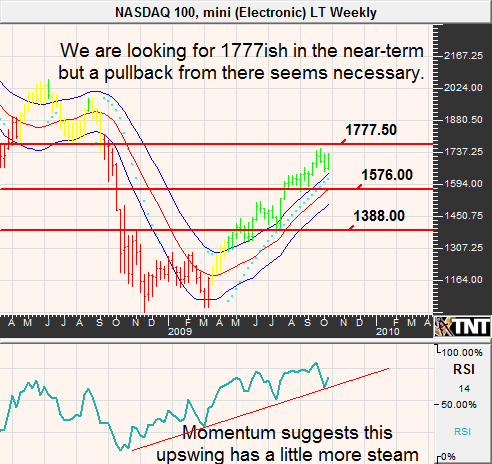 Similarly, the NASDAQ could see 1777 or a bit higher but should struggle to forge gains at such lofty levels. The corrective trade could possibly bring the S&P to just below 1000 and the NASDAQ to the mid 1570's. Seasonals suggest that October could be a rocky month but it is also known as the "bear killer". If we get the correction that we are looking for, be careful not to become overly bearish. Late October tends to be a great time to buy depressed stocks. Treasury traders, and investors, appear to be having a hard time "buying" into the equity rally. It seems as though the ridiculously high PE ratios have left government fixed income securities in favor as many are doubting the equity run. Consequently, we have witnessed stocks and bonds rally together. There is a tremendous amount of underlying support in Treasuries despite speculation of higher inflation and a tumbling dollar. While we think that the recent weakness in bonds and notes could extend itself for a short period of time we also believe that November and December will see firm interest rate products. While inflation will eventually rear its ugly head and the Fed's efforts to artificially cap interest rates will subside, we don't think that the bond down-draft will occur in 2009. Accordingly, persistent bears should be prudent about getting good entries but buying on dips may be a better proposition. Last month we mentioned that we would be bearish on a rally in the long bond to 122 which could reach as high as 124 and things have worked out nicely. Going forward we are compelled to play the other side of the market despite widespread bearish sentiment in the media and what are already lofty bond prices. 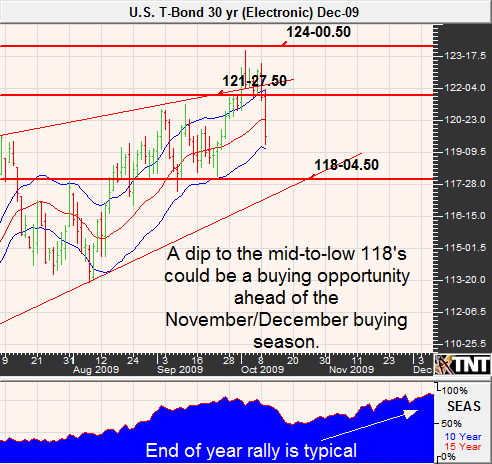 We are looking for a dip in the 30-year bond to the mid-to-low 118 area in order to establish bullish positions. If we are right about the possibility of a looming, but not immediate, equity correction the timing should work out. If you are a note trader, you might want to begin looking at the long side of the market in the mid-116's. October is the month that corn and soybeans tend to find their harvest lows; therefore, this is generally not the time to be a grain bear. Instead, traders should look to hold a slightly bullish bias. 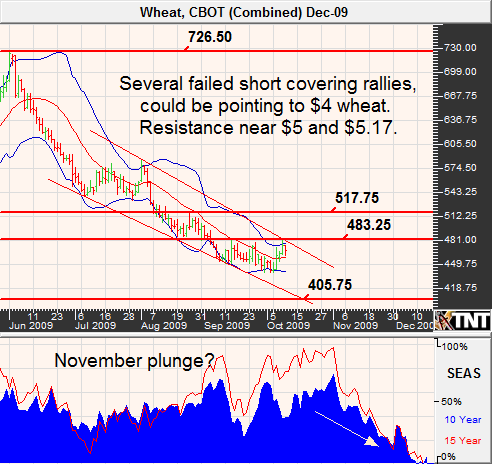 However, we can't help but feel as though the U.S. dollar will undermine the recovery of grain prices. Recent weakness in the greenback has caused domestically produced and priced commodities (such as corn, wheat and soybeans) to become cheaper in the eyes of foreign buyers. The increased demand for these products has kept a floor under pricing but a recovery in the dollar will work against this phenomenon. 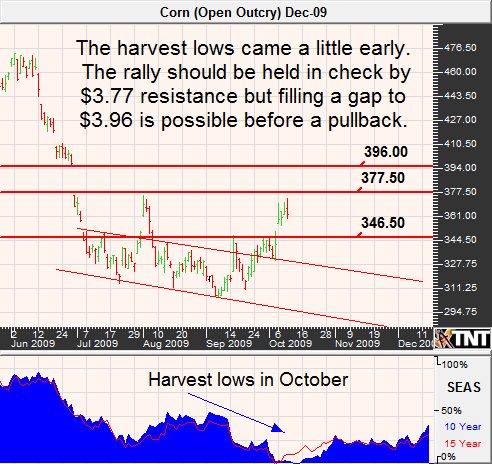 Another antagonist to seasonally higher grain prices is a potential waning in the stock market. Lower equities translates into expectations of a less robust economic recovery and in turn lower demand forecasts for grain products. Corn prices have suffered at the hands of the second largest planting since 1944 and appear to have found a near-term low in the $3.00 area in September. While the harvest lows are normally made in October, it may have come a bit early this year. With that said, we don't see any reason as to why the rally should be able to extend much higher than current levels and are looking for a possible retest of the lows and possibly even prices in the $2.75 area. On October 9th, the USDA increased its estimate of ending stocks to 1.672 from 1.635 billion bushels but cold weather in the grain belt kept prices elevated...at least for now. Exports remain relatively strong. The USDA expects exports to be up 16% for the 2009/2010 crop year and so far they are up 20%. On the contrary, on October 5th the USDA reported that 70% of the corn was rated good to excelled and 10% of it was harvested. Despite seasonal strength, we expect that resistance in the $3.80 area will hold but respect the possibility of a spike to just under $4.00. Traders might look to become bears from noted levels by buying cheap puts (such as the December 340's or lower), selling calls or a combination of the two. It is only fair that we point out that our near-term prediction is going against the grain. According to the Commodity Trader's Almanac, one of the best seasonal trades is going long corn on or about October 28th and holding until May 11th. This trade has been profitable in 34 of the last 40 years with a cumulative profit of approximately $44,838. Despite dramatic bouts of volatility, soybean prices have essentially been range-bound during the last six months. The most recent rally can be largely attributed to heavy short covering ahead of the USDA data and option expiration. 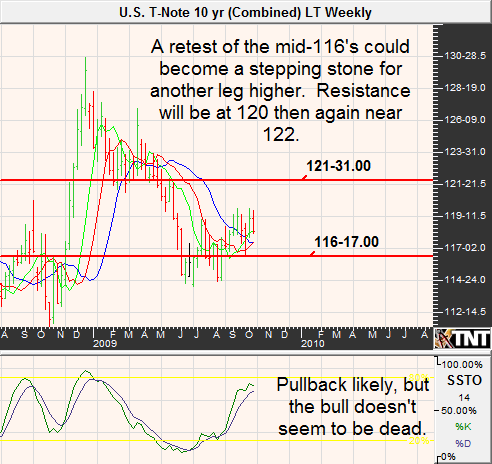 The next week or two of trade will determine whether or not this bull will have legs. Similar to corn, we are entering a seasonally favorable time of year for bean prices. According to "the" almanac, traders going long soybeans on or about October 22 and holding until November 9th have fared well throughout history. In the last 40 years, this trade has been profitable 36 times for a cumulative profit of $35,775. As a word of caution, blindly following such seasonal recommendations can be dangerous. You will notice that most publications don't disclose the size of the losers during years that things didn't work as planned. Also, they don't mention how large the draw-downs might be prior to the trade becoming profitable. Nonetheless, it can be a good guide. 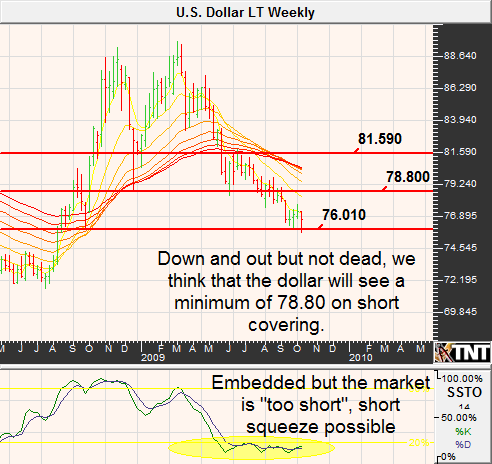 Last month we noted a potential short squeeze to $9.84 and not long after the market rallied to $9.77 before failing. 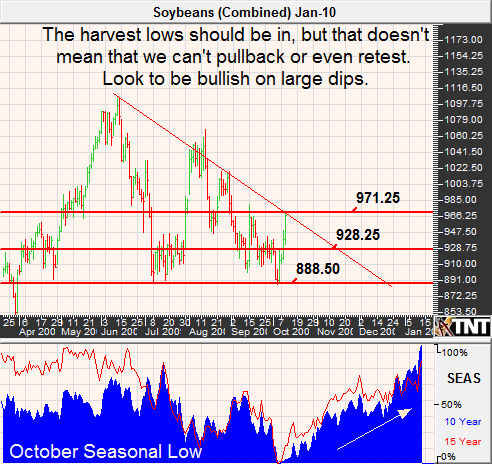 More recently, we have seen a similar spike in beans triggered by frost rumors but propelled by elected stops to $9.68. We still see potential for the $9.84 area and with support from the cold front a test of $10.00 is possible; however, we doubt that the overall trend has reversed to the upside. We prefer being a bear on rallies; especially in light of our expectations for a stronger dollar at some point in the coming weeks. First support will come in at $9.25 then again near $8.80. If you want to be a bull, look for large dips. Wheat bears have been persistent and despite everything pointing toward a market that was simply "too short", prices have avoided any significant short-covering rallies. We feel as though the window of opportunity for the bulls is quickly closing but respect a potential rally to $5.00 and maybe even $5.17. Nonetheless, if such levels are seen we predict that they will be a gift to the bears. Seasonality suggests that late October and early November will see a swift slide in wheat. While current prices are significantly lower than the June highs and arguably oversold, they are still historically steep. We wouldn't be surprised to see a move to $4 by November. We like selling on rallies using futures, options or a combination of the two. Contact us if you would like help with a strategy. There has been a minor disconnect in the relationship between crude oil and equity prices. The two markets have been moving in lockstep with each other overall but in recent weeks new highs in the S&P have not translated into new highs in oil. Given this inherent weakness, we wonder if crude oil will be able to hold its ground in a climate in which equities are struggling. Also working against crude are the seasonal tendencies for oil to trade weaker from September 11 through December 9th. Similar to currency traders, energy traders are in the midst of the debate between inflation and deflation; this is likely the cause of recent directionless trade. As mentioned briefly, we are leaning higher in the dollar (which isn't a popular stance to take) from current levels. If we are right about a looming currency reversal, it might work in favor of our prediction for lower oil prices in the near-term. Demand estimates continue to taper but are still relatively stable. The Department of Energy is calling for usage of 83.7 billion barrels per day on average in 2009 and 84.8 in 2010. This should prevent a complete meltdown in the complex but likely won't be enough to stave off moderately bearish trade. 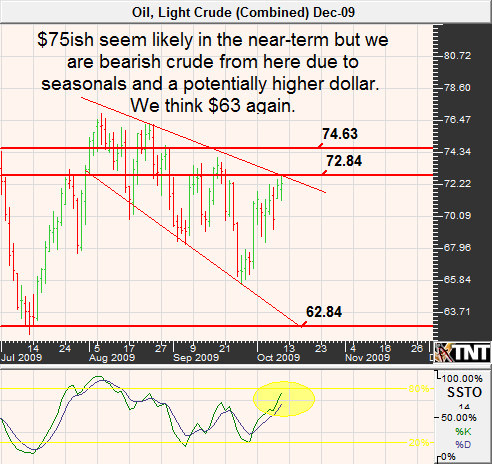 We can't rule out a run in December crude to about $75 per barrel, in fact it seems likely. Nonetheless, we believe that the rally will be cut short at or near such levels. Assuming a higher dollar and lower equities, we believe that crude oil could make its way down to $63. Gold and silver prices have enjoyed a spectacular rally as of late as investors are flocking to quality and the dollar wanes. The question remains whether prices have gotten ahead of themselves or if this mania will continue. If you ask us, the gold bugs might be running for cover soon. We have a hard time joining the bull bandwagon when it seems as though the others are already on board. If all of the bulls are in, who will be left to buy? We made similar claims in the summer of 2009 and sure enough, the rug was pulled from underneath the market. This feels like a similar situation. Keep in mind that the production cost for gold is somewhere around $500. Therefore, at current pricing investors are willing to pay twice as much for gold due to the extrinsic value that they perceive it to have. The bulls argue that it is an inflation hedge, or somehow offers safety over dollar based assets. However, history suggests otherwise. Nonetheless, it is a speculative vehicle and traders can bid the prices as high as they see fit. The bottom line is that when market euphoria is upon us, it is usually a great indication of a trend reversal. Constant infomercial pleas and the fact that my pesticide technician asked me if he should "invest" in gold seems to be the perfect contrarian indicator. Additionally, seasonal tendencies are weaker through November 6th. Last month we were predicting a spike to $1,020 and the rally exceeded our expectations a bit but we can't help but feel as though the path of least resistance will be lower from here. $1,020 will become the new support but we think that under $1,000 will be seen as seasonality and a stronger dollar will take hold of price action. 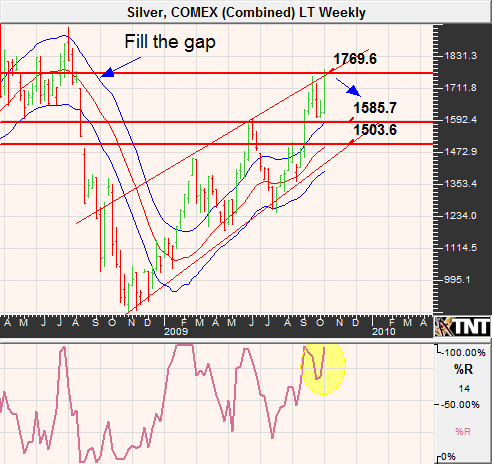 In last month's newsletter we pointed out a gap in silver that if filled would bring prices to the $17.38 area. However, as in gold we underestimated the strength of this market. With prices now at $17.67 we feel like the upside objectives have been met and a pullback seems necessary. First support will be at $15.85. The dollar index has fallen out of favor as quality seekers have moved to gold. Rumors relating to removing the greenback as the reserve currency and changing the way that crude oil is priced (from dollars to a basket of currencies) has worked against the dollar. However, we believe that currency market volatility will pick up once again and that the U.S. dollar will manage to stage a price recovery. In the last newsletter we advised clients to "wait for a dip to the 76 area before placing bets on the long side" of the dollar index. Now that we are here, we still feel the same way. Opposite the equity market which has been reacting positively to "not-so-bad" news the dollar has suffered against currencies which face similarly dismal fundamentals. The Euro makes up about 60% of the U.S. dollar index and appears to have benefitted in price far more than fundamentals suggest would be appropriate. Additionally, U.S. corporations tend to move funds from overseas operations for payroll and pension fund institutions in preparation for the new year. Seasonal strength in the greenback typically extends into January. Our first upside target will be 78.80. Being bullish the dollar typically involves being bearish the euro, and this is no exception. The European economy is improving but second quarter GDP was reported as a decline of 4.9% from last year and is expected to be flat in 2010. Also, the August unemployment rate was calculated to be 9.1%, the highest rate since march of 2004. Clearly the domestic economy has its challenges but all is not well in Euro-land either. We think that currency traders will fail to find reasons to be buyers at these levels. 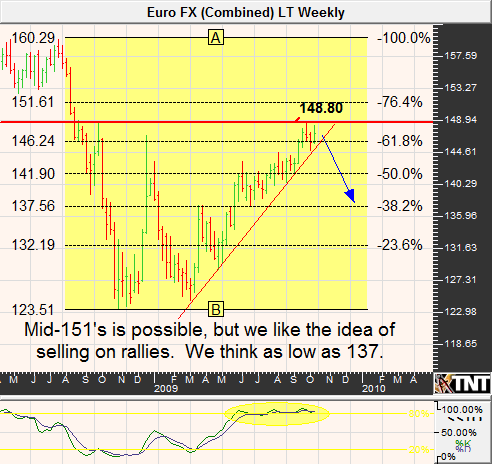 Look for a retreat in the Euro to under 1.40 in the coming months. Our first downside target will be 1.4260. We were off the mark in our call in sugar last month. While we were eventually right about the overall direction of prices, we underestimated the size of the technical bounce that occurred prior to the price retreat. Extreme volatility in recent trading makes this market highly unpredictable. Up until the most recent newsletter, we had maintained an overall bullish bias in sugar because this market is experiencing the lowest stocks to use ratio in 16 years. That, combined with weather problems in Brazil and India pushed prices to their highest levels since 1981. The plunge from the highs has been dramatic and may have some room to move on the downside but the bulls should be ready to step back in. Sugar prices are seasonally firm in November and with trend-line support looming at 20.67 and 125-day moving average in the mid-to-low 19 cent area we could see some stabilization soon. Aggressive traders may look to play off of the first support but, if in it for the long-term, should be willing to risk it below the second area of support. Coffee has been a difficult market to call, and it looks like things won't be changing at any time soon. Although technically overbought in the near-term, we see the overall trend in coffee being higher throughout October. This is the time in which demand tends to increase as a result of commercial stocking ahead of the winter months. 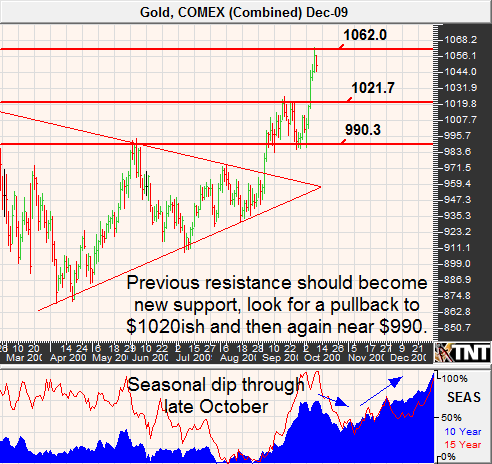 There continues to be fundamental support for coffee prices. Colombian National Coffee Growers Federation predicts that the current harvest may fall to 10.3 million bags or less due to excess rain at harvest. This was a downward revision from 11.5 million a year ago. We don't have a strong opinion in coffee either way and will leave this one up to you. However, look for support near 126 and again under 119. 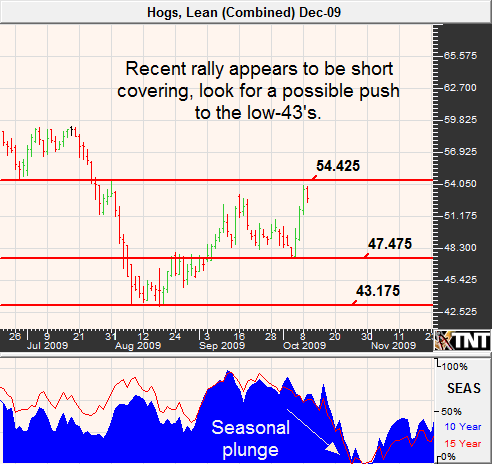 We are not convinced that recent buying in the hog market was actual buying interest as opposed to short covering. Although, it is important to note that hog prices remain cheap and below the cost of production. Eventually, this will force many hog farmers out of business and drive prices higher due to lower supplies. In the meantime, lean hogs normally remain in a seasonal downtrend through October and we are going to lean toward a strategy of selling into rallies. We see support near the mid 47 cent area but wouldn't be surprised to see a retest of the lows near 43 cents before a longer-term rally can occur. The demand for beef is said to increase in November and this tends to be supportive for prices. However, signals are mixed for the month of October. Cattle prices are fundamentally cheap but the chart suggests that the current trading range could lead prices lower from here. Additionally, exports continue to struggle. 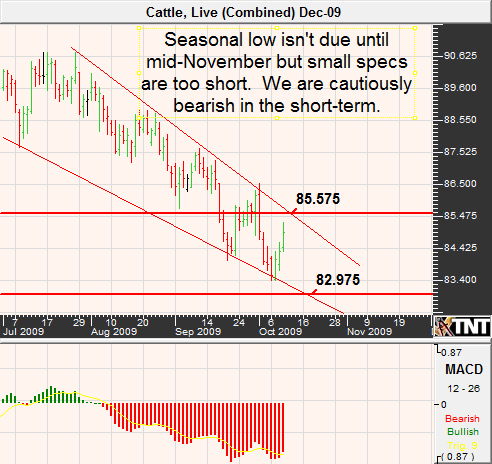 We begin to like the long side of cattle as prices approach 83 cents.